The 630 m band is only 7 kHz wide, so signals shouldn't occupy too much space. IARU Region I recommendation VA14_C4_REC_02 suggests a maximum signal bandwidth of 200 Hz. As a result the most popular QSO modes are CW and narrow banded weak signal modes such QRSS, DFCW, JT9, FT8 and WSQ. Also very popular are beacon-like transmissions using WSPR and, to a lesser extent, Opera. Occasional you may come across some other digital signals such as PSK or RTTY. CW signals are found in the lower part of the band (472-475 kHz), with most activity below 473.5kHz. Most CW activity is in the evening. As QRM and QRN levels often are high a good CW-filter is recommended for best results. Depending on your location, your equipment, the propagation and ERP of the transmitting station you can expect to be able to hear CW signals up to 2000 km distance. Intercontinental contacts in CW are possible, but rather rare. QRSS is very slow CW: typical 3 seconds dot length (named QRSS3) or 10 seconds dot length ﻿(named QRSS10), what equals to 0.4 or 0.12 WPM. Signal "decoding" is not done by ear but on screen, using dedicated DSP software. The SNR (signal to noise) ratio of a signal can be improved by reducing the receiver bandwidth. Reducing the receiver bandwidth by 50% will result in a 3 dB SNR improvement. But the minimum receiver bandwidth is determined by the spectrum of the signal. A SSB signal for example has a spectrum of 2.4 kHz, so the receiver bandwidth has to be (at least) 2.4 kHz in order to receive a SSB signal without distortion. For CW the signal spectrum depends on the keying speed: at 12 WPM the spectrum is 10 Hz wide, at 30 WPM even 25 Hz. By slowing down the keying speed to 0.4 WPM (3 seconds dot length) the signal spectrum is reduced to 0.333 Hz. This will result in a SNR improvement of almost 15 dB. Or in order to get the same SNR of a 1 W QRSS3 transmitter a 30 W transmitter will be needed for CW at 12 WPM. A extensive primer on QRSS and DFCW can be found here. DFCW (Dual Frequency CW) is a mode very similar to QRSS: now dots and dashes have the same length but are transmitted on (slightly) different frequencies. The advantage of DFCW is that it enhances the average speed by a factor of 2.5 to 3 compared to QRSS (at the same dot length). The main disadvantage is the larger bandwidth. DFCW also requires (A)FSK modulation of the transmitter whereas for QRSS just simple "on/off" keying is needed. 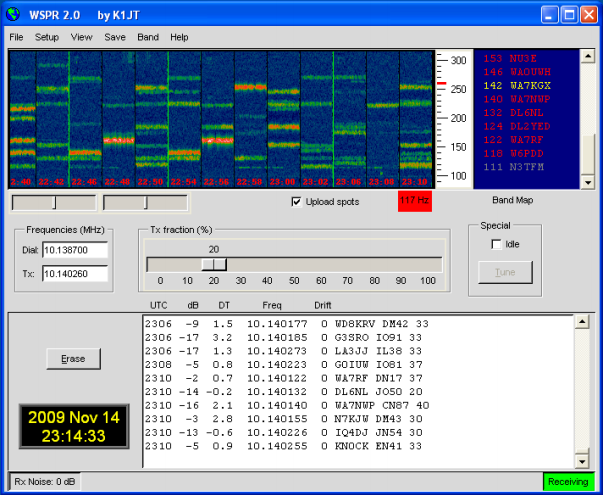 JT9 is a mode developed by Joe Taylor (K1JT). In contradiction to QRSS the bandwidth is not extremely narrow, about 14 Hz (versus 0.333 Hz for QRSS3). JT9-1 is a FSK (Frequency Shift Keying) mode extremely optimised for a basic QSO (exchange of callsigns and signal reports). All transmitted information (such as call signs and reports) is efficiently coded and a very strong FEC protocol (forward error correction) is used to improve the SNR. In addition the data stream contains a pseudo-random number sequence in order to provide accurate time and frequency synchronisation. 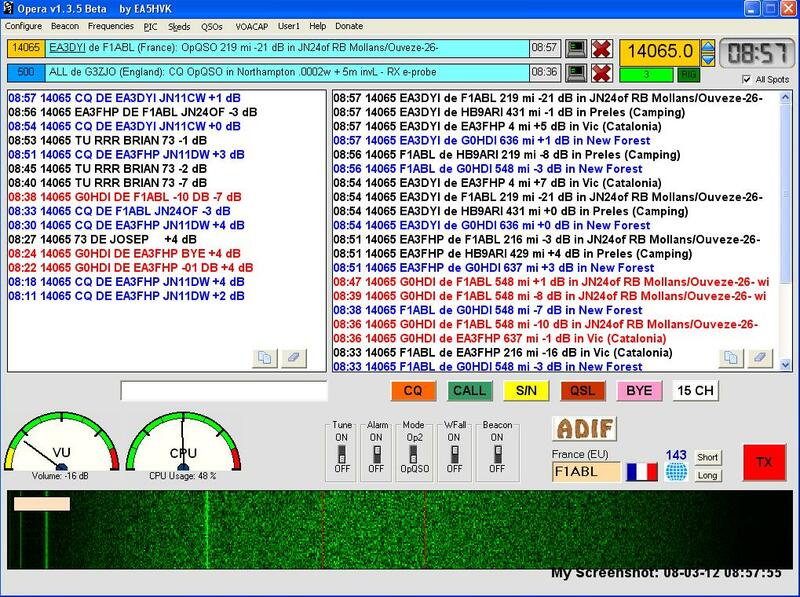 The WSJT-X software, that includes JT9, can be downloaded here. JT9 is transmitted in sequences that always start at 1 second into the minute and take about 50 seconds. For that reason the computer needs a good time synchronisation, but this is easily achieved via (S)NTP. If all sequences are decoded a JT9 QSO takes only 6 minutes, much less than a typical QRSS3 QSO (20-30 minutes) while both modes provide about the same SNR. Initialy WSJT-X supported several JT9 submodes that differed in bitrate. Depending on the submode a TX (or RX) cycle takes 1, 2, 5 10 or 30 minutes. The slower submodes have a lower SNR treshold, but are also more vulnerabe to frequenct instabilities of any kind (including ionosperic doppler shift). And of course: the slower the bitrate the longer it takes to complete a QSO. For these reasons the slower submodes were abandoned by WSJT-X. But on 630 m and 2200 m frequency stabilities are far less a problem than on HF and signals are usually much weaker, so the slower JT9 submodes can be very useful. For that reason SlowJT9 was developed, supporting the 1, 2, 5 and 10 minute cycle JT9 submodes. SlowJT9 can be downloaded here. From the operators side FT8 is pretty similar to JT9, but it is 4 times faster. 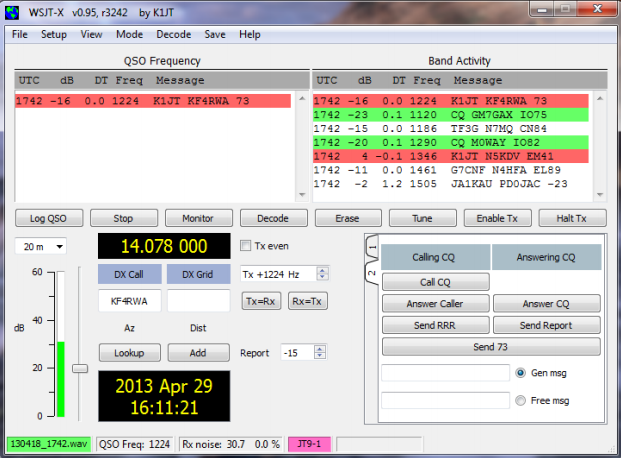 With a 15 seconds transmision cycle a basic QSO can be completed within 1 minute. But there is no such thing as a free meal: the increased speed comes at the expense of ± 6 dB loss in sensitivity and a 3 times larger bandwidth than JT9. Compared to CW however FT8 is very competitive, in regard with speed as well as sensitivity (although the true CW operator might prefer the "gusto" of CW). FT8 is included in WSJT-X (version 1.8 onward). WSQ stands for Weak Signal QSO. This mode is developed by Con Wassilieff (ZL2AFP) and modified by Wolf Büscher (DL4YHF). It is a IFK (Incremental Frequency Keying) mode. 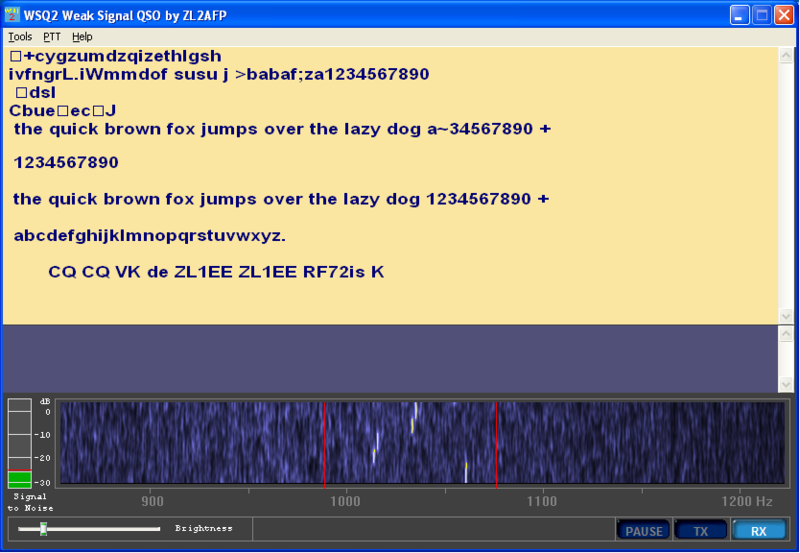 Unlike JT9-1, WSQ does not use message coding or FEC, nor it is transmitted in sequences. Furthermore it uses varicoding to achieve high text efficiency. All this makes it a very flexible (as RTTY or PSK) and yet sensitive mode. The typical character throughput is about 5 WPM. A detailed description of WSQ can be found here. DL4YHF's version of the software can be downloaded here. WSPR (pronounced "whisper") is another mode developed by Joe Taylor (K1JT) and stands for “Weak Signal Propagation Reporter.” The WSPR software is designed for probing potential radio propagation paths using low power beacon-like transmissions. WSPR signals convey a callsign, Maidenhead grid locator, and power level using a compressed data format with strong forward error correction and narrow-band 4-FSK modulation. The protocol is effective at signal-to-noise ratios as low as –28 dB in a 2500 Hz bandwidth. Receiving stations with internet access may automatically upload reception reports to a central database. The WSPRnet web site provides a simple user interface for querying the database, a mapping facility, and many other features. Note that WSPR is not a QSO mode. More information about WSPR, including download of the software, can de found here. Opera is a weak signal beacon mode developed by Jose Alberto Nieto Ros (EA5HVK). Just as WSPR, it is not a QSO mode. It also uses forward error correction and a compressed data format in order to improve SNR. A main difference between Opera and WSPR is that Opera uses "on/off" keying instead of FSK. The advantage is that any CW transmitter can be used, the inherent disadvantage is a 3 dB lower average power compared to FSK modulation. In contradiction to WSPR (and also WSJT-X, WSQ) the code of Opera is not open source. The "deep search" functionality of Opera, that takes advantage of information exchange over internet as an aid to decode very weak signals, is rather contested. Opera can be downloaded here.